“A recent study from the Department of Veterans Affairs shows that the number of Iraq and Afghanistan vets diagnosed with post-traumatic stress disorder is rising rapidly…” – Minnesota Public Radio. Over the past few years, cases of PTSD have been increasing and museums around North America are responding. At the Canadian War Museum in Ottawa, Canada, a painting by Colin Gill called Canadian Observation Post has been used to help treat PTSD among Canadian soldiers. Alison Howell wrote in her paper “The Art of Governing Trauma: Treating PTSD in the Canadian Military as a Foreign Policy Practice” that the painting has gained a lot of attention recently in Canada as a way to tell the story of PTSD. This entry was posted in Cognitive Disabilities and tagged e.kotecki. Bookmark the permalink. I recently realized that “shell shock” as it was called in the early part of the 20th century was the same as PTSD. 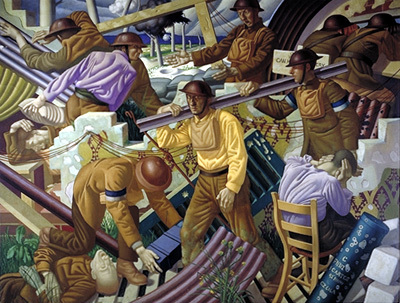 I imagine that a painting depicting the malady from a previous war would help validate current veterans–showing that they are not alone and PTSD is not a new thing… I am intrigued that museums are addressing this huge current mental impairment through art. It makes sense–I just never thought about how museums might address it. National Parks have long been used as places for healing returning veterans. It is important to remember that our cultural institutions and natural refuges are helpful in the healing process for wounded warriors.